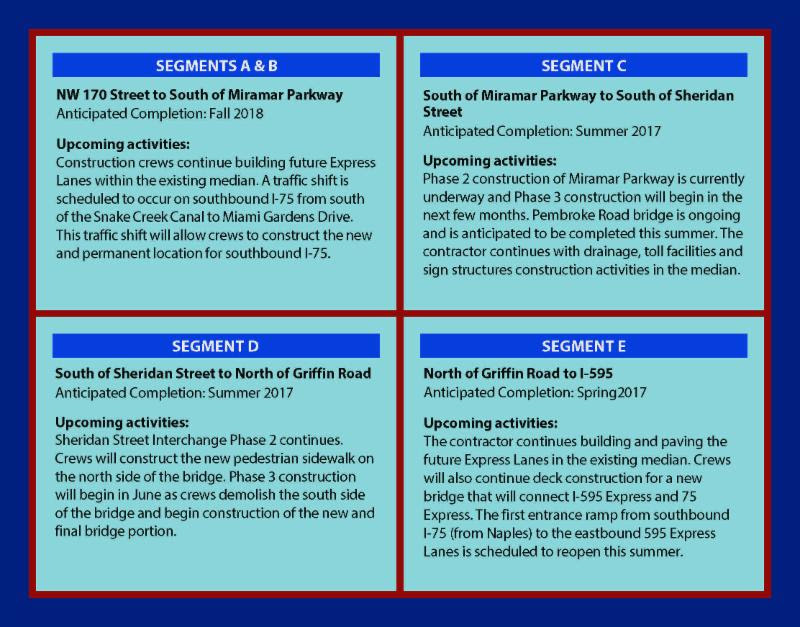 Phase 2 construction of Miramar Parkway is currently underway as crews continue work in the middle bridge section. This phase is anticipated to be completed this summer. Phase 3 construction will begin in the next few months. As part of this final phase, westbound traffic will be shifted onto the newly constructed middle bridge section. Crews will then demolish the westbound section of the existing bridge and will begin construction of the final section of the new bridge. The final configuration will include three through lanes in the westbound and eastbound direction. In addition, there will be triple turning lanes from eastbound Miramar Parkway to I-75 northbound. Motorists on westbound Miramar Parkway will have triple turning lanes to I-75 southbound as well. The Miramar Parkway interchange is anticipated to be completed in early 2017. This entry was posted in News on May 26, 2016 by Realty Services Florida. The ramp from I-595 westbound to southbound I-75 (to Miami) will be closed nightly from 10:00 p.m. to 6:00 a.m. on Wednesday, May 11 and Thursday, May 12. Motorists will be detoured to exit at Glades Parkway (Exit 22), go south on Glades Parkway, east on Royal Palm Boulevard and then take the entrance ramp to enter southbound I-75. 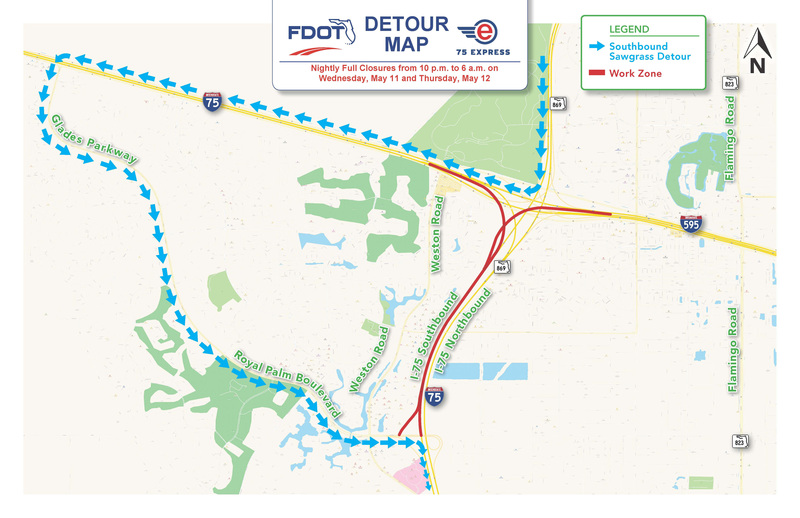 All southbound lanes of the Sawgrass Expressway at the I-595 interchange will be closed nightly from 10:00 p.m. to 6:00 a.m. on Wednesday, May 11 and Thursday, May 12. Motorists will be detoured to take the entrance ramp to northbound I-75 to Naples, exit Glades Parkway (Exit 22), go south on Glades Parkway, east on Royal Palm Boulevard and then take the entrance ramp to enter southbound I-75. *Please note the ramp from southbound Sawgrass Expressway to eastbound I-595 will remain open. The ramp from southbound I-75 (from Naples) at the I-595 interchange will be closed nightly from10:00 p.m. to 6:00 a.m. on Wednesday, May 11 and Thursday, May 12. Motorists will be detoured to continue to eastbound I-595, exit on Flamingo Road (Exit 2), go east on SR 84, make a U-turn on Flamingo road, west on SR 84 to Weston Road, south on Weston Road to continue east on Royal Palm Boulevard and then take the entrance ramp to enter southbound I-75. This entry was posted in News on May 11, 2016 by Realty Services Florida. All lanes of northbound Florida’s Turnpike at the I-75 interchange will be closed from 11 p.m.Monday, May 2 to 5 a.m. Tuesday, May 3. 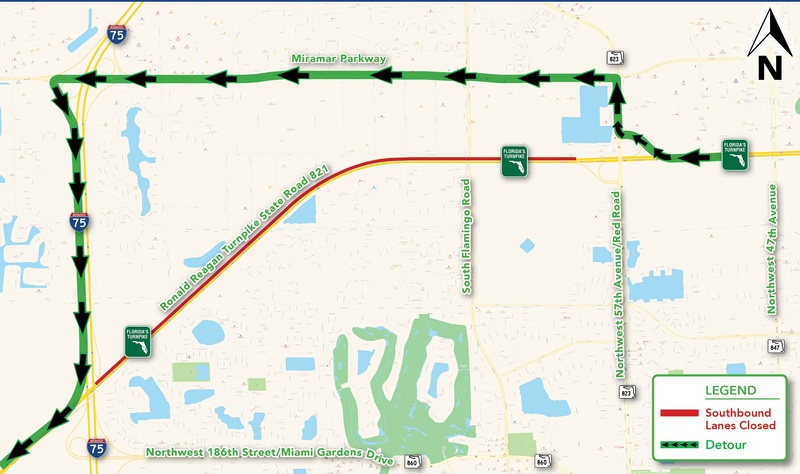 Motorists will be able to take the entrance ramp to northbound I-75 (Exit 39), exit at Miramar Parkway East (Exit 7A), continue east on Miramar Parkway to NW 57 Avenue / Red Road and turn south on NW 57 Avenue / Red Road to re-enter northbound Florida’s Turnpike. Please follow the posted detour. 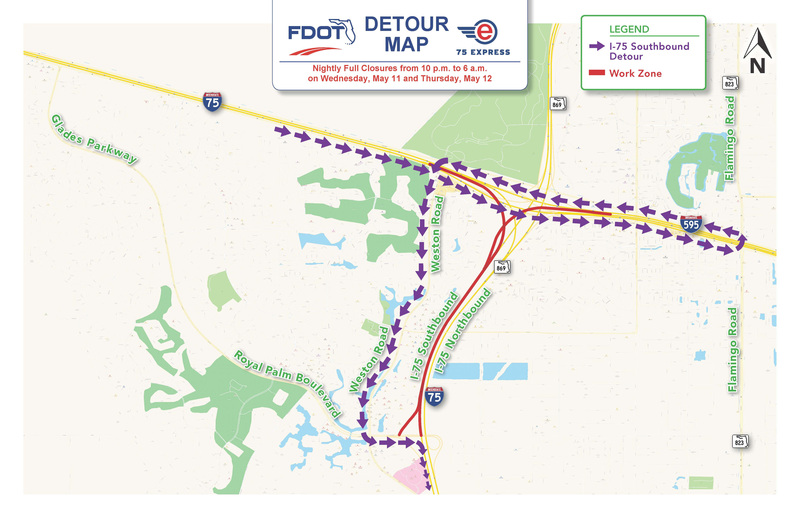 All lanes of southbound Florida’s Turnpike at the I-75 interchange will be closed from 11 p.m.Thursday, May 5 to 5 a.m. Friday, May 6. 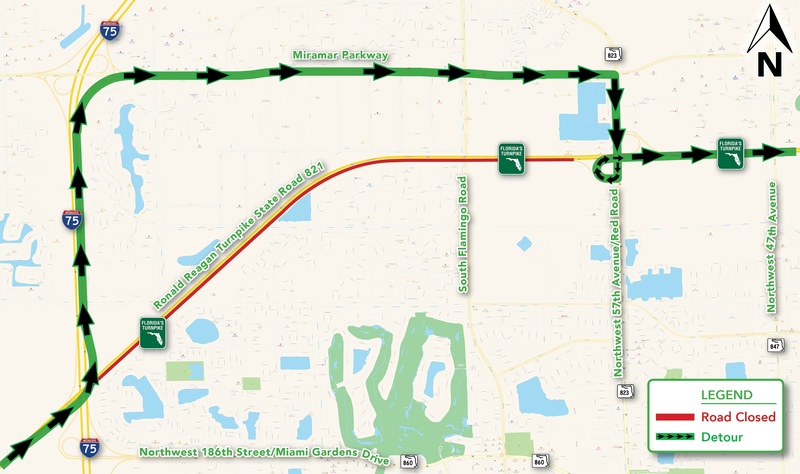 Motorists will be able to take the exit ramp to NW 57th Avenue / Red Road (Exit 43), continue north on NW 57th Avenue / Red Road and turn west on Miramar Parkway to enter southbound I-75 and then take the entrance ramp to re-enter southbound Florida’s Turnpike (Exit 39). Please follow the posted detour. This entry was posted in News on May 2, 2016 by Realty Services Florida.